Clarkias are annual plants that are easy to grow in our gardens. This is good because their charismatic flowers can become an obsession. Clarkias bloom at the end of the wildflower season, hence their common name “Farewell-to-Spring”. In most wildflower mixes, Clarkias are included and they extend the blooming period of the mix into June. At the flower market, Clarkias are sold as Godetias and this refers to an older name of the genus which was abandoned long ago, but is still used in the flower trade. The flower is really Clarkia amoena ssp. whitneyi, a spectacularly large flower that is in the color range red-pink-white. Plant breeders have been creating beautiful hybrids which have deep colors and double or triple petals. 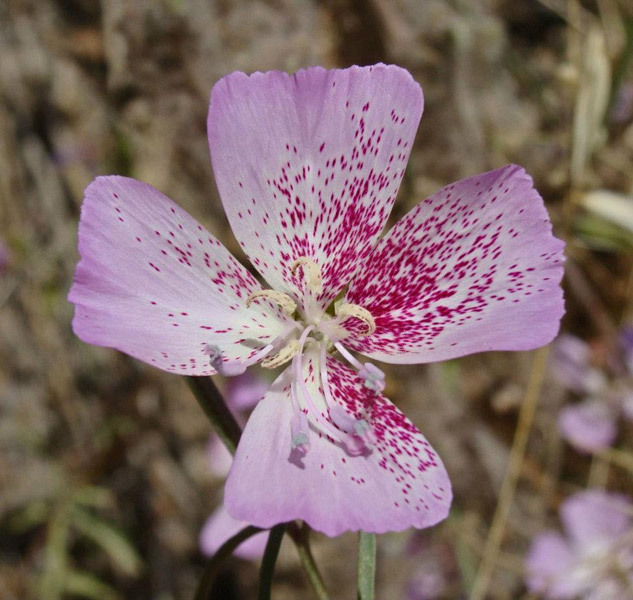 In the new Jepson Manual, 40 species of Clarkia are recognized along with many sub-species. The Clarkia flowers are generally in pink tones with two flower types–the bowl, with four entire petals arranged in a bowl; often with flashy red blotch at the base of the petal…i.e. C. amoena and C. rubicunda. The second type is a rotate or non-bowl shape, some of which have lobes…i.e. C. concinna and C. unguiculata. C. unguiculata, elegant Clarkia was sent to England in 1840 by David Douglas and the plant breeders have been creating beautiful hybrids which have deep colors and double or triple petals since that time. When the rains are nicely spaced and a lot of plants come into bloom, annual wildflowers can give us spectacular displays. This year is only so-so here in Sonoma County but last year (2011) was spectacular. The bright pink Clarkias burst from the roadsides. In the Sierra, I was thrilled with a show of fort miller clarkia (Clarkia williamsonii) that filled the mountain meadows. I have yet to purchase seeds of C. williamsonii, but you can be sure that it is on my list of seeds to buy. In the wild, Clarkias are joined at the end of the season with Ithuriel’s spear (Triteleia laxa) and harvest brodiaea (Brodiaea elegans) also the Calochortus species…in Sonoma County, yellow mariposa lily (Calochortus luteus) is prominent in June. These are plants that grow from bulbs and they can be purchased to recreate a wildflower meadow in the garden. Liz Parsons has been the chairman of the annual CNPS Milo Baker Plant Sale for 30 years and has propagated and grown many of the plants for the sale each year. Liz is also a CNPS Fellow, a designation of high distinction bestowed upon CNPS members who have accumulated extraordinary accomplishments towards the understanding, appreciation, and preservation of California native plants. Do you know of anyone who is selling seeds of Clarkia imbricata? I’d like to plant some to help perpetuate the species, which is endangered.